The Spanish elected a member of our government yesterday – not that you would have seen any newspaper report the Spanish general election in those terms. Such subtleties are quite beyond the average hack, and would leave the current raft of editors gasping for breath. But, if the member changes, in this case the member of the European Council, the government in Brussels does not. It goes on regardless, as indeed does that government in Madrid. 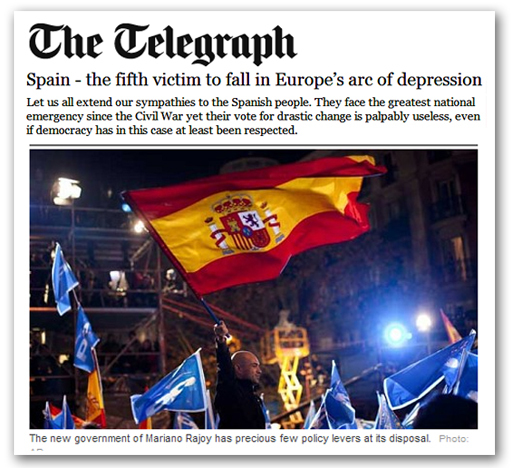 The people may have dumped socialist José Luis Rodríguez Zapatero, and replaced him with conservative Mariano Rajoy but, as The Guardian observes, very little else seems to have changed. Mr Rajoy and his team are not acting like they are in charge. Politicians, it says, gave much of their sovereignty away in the past decade. A similar theme is echoed by Ambrose in The Failygraph, who argues that the Spanish people face the greatest national emergency since the Civil War, yet their vote for drastic change is palpably useless, even if democracy has in this case at least been respected. And there we have evidence of the media collective having lost it. Spain has been through a ritual involving a change of personnel at high level in their ruling classes, but if nothing much has changed, and the people are no more empowered today than they were yesterday, how is this democracy? The word actually means "people power" – government by the people, for the people and all that. The people have had elections, but they have no power. This is putting form before substance. It is the trappings of democracy, but it isn't democracy. Democracy has not been "respected". It has been supplanted by a meaningless ritual. That the power lies elsewhere is the thrust of Ambrose's piece – it is what The Guardian tells us. But they and others miss they point. If the power no longer resides with the people, then we are most decidedly not dealing with a democracy. And thus, election or no election, nothing good will come of the changes at the top. Whatever brief honeymoon the new man may enjoy, very quickly will set in the disillusionment that already pervades Spanish politics (and European politics in general). For the moment, though, the media and the political classes are still holding the line, pretending that the form of the democratic election has any meaning. But Spain and the rest of us will quickly discover that, whether our governments are appointed, as in the recent case of Greece and Italy, or go through the charade of an election, it makes very little difference. And that difference, would that the phalanx of hacks realise it, is represented in that singular but unremarked fact that Mr Rajoy is also a member of the supreme government of the United Kingdom. We, the people, no longer have any real say in how we are governed. Democracy has long departed.